All Nippon Airways (ANA) is announcing its revised flight schedule for the second half of Fiscal Year 2018 (FY2018). In the first half of this fiscal year, ANA continued to expand its international network by pursuing its “dual hub model” in the Tokyo Metropolitan Area, such as by increasing the routes between Tokyo/Haneda and Bangkok on June 1 and further improving its high-quality service, comfort, and punctuality. Also as for the domestic network, ANA has been enhancing the service by offering free in-flight Wi-Fi service and adjusting the number of flights and the size of the aircraft according to the demand of the market. In terms of cargo service, ANA will reorganize the Okinawa freight hub to increase network efficiency, while positioning Naha Airport as a distribution centre for major cities in Japan and Asia. ANA considered factors such as the impact of the required Rolls Royce engine inspections and determined the optimum allocation of its resources for the second half of FY2018. Therefore, the company does not anticipate further flight cancellations and inconveniences for its valued customers due to the engine inspections. Safety is always our top priority and we will continuously work closely with Rolls Royce with the aim to resolve the situation. The Available Seat Kilometers (ASK), for the second half of FY2018 is expected to be at 100 percent year-on-year for international service and 102 percent for domestic service. In comparison to the original plan for the second half of FY2018, the ASK is expected to be 96 percent for international service and 101 percent for domestic service. Through these changes, ANA aims to continue providing world-class service to its valued customers. Its advanced fleet of planes and award-winning service aid ANA in getting its passengers to their destinations, comfortably, safely and on time. 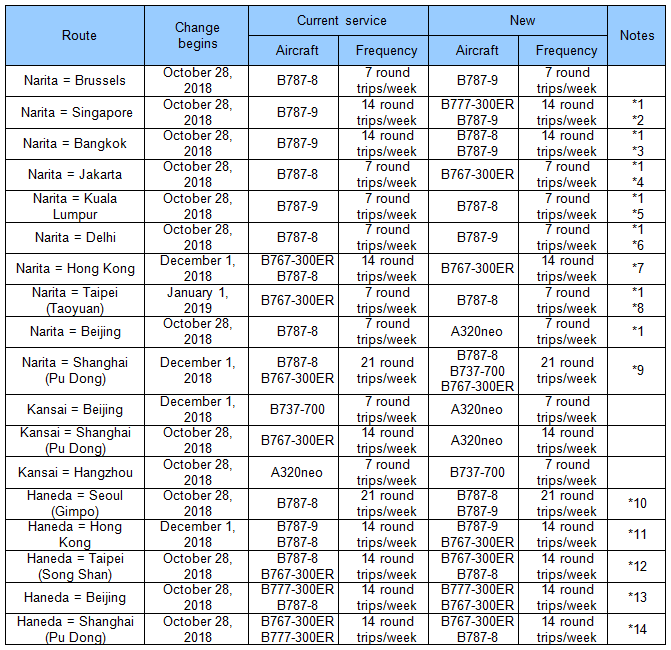 Below are the details about ANA’s latest schedule and frequency for the international, domestic, and freighter routes. *Fight plans are subject to approval by the relevant authorities. All schedules are subject to change. In addition to robust business demand, we aim to capture strong demand for visits from China and other Asian countries and strengthen yield management. ANA will continue introducing the state-of-the-art Airbus A320 neo aircraft, which combines efficiency and comfort, on international short-distance routes. In addition, ANA will be receiving the latest Boeing 787-10, and the Airbus A380, the world’s largest and first-in-Japan passenger plane. ANA plans to launch these aircraft in early FY 2019. During the second half of FY2018, some international flights will be reduced, but ANA is planning to resume some of the flights from February 2019. *1 It will be operated on a B737-700 from February 24, 2019. *2 Flights NH175/176 will not be operated during this period. *1 The aircraft types used to service return flights will be changed on the following day. *2 NH801/802 will be operated on a B777-300ER. However, from February 8, 2019, it will be operated on a B787-9. NH803/804 will be operated on a B787-9. *3 NH805/806 will be operated on a B787-8. Introduction of Premium Economy service will be postponed. NH807/808 will be operated on a B787-9. *4 It will be operated on a B787-8 after December 1, 2018. *5 Due to the aircraft change, Premium Economy service will be suspended. *6 It will be operated on a B787-8 after February 1, 2019. *7 NH809/810 will be operated on a B767-300ER. NH811/812 will be operated on a B767-300ER after December 1, 2018. The aircraft type used to service return flights will be changed on the following day. *8 It will be operated on a B767-300ER between February 1 – 16, 2019 and after March 1, 2019. *9 NH919/920 will be operated on a B787-8. However, from March 1, 2019, it will be operated on a B767-300ER. NH921/922 will be operated on a B767-300ER. NH959/960 will be operated on a B737-700. However, from March 1, 2019, it will be operated on a B787-8. *10 NH861/864/865/868 will be operated on a B787-8. NH862/867 will be operated on a B787-9. However, from February 17, 2019, it will be operated on a B787-8. The aircraft types used to service return flights will be changed on the following day. *11 NH859/860 will be operated on a B787-9. NH821/822 will be operated on a B767-300ER. *12 NH851/852 will be operated on a B767-300ER. However, from March 1, 2019, it will be operated on a B787-8. NH853/854 will be operated on a B787-8. *13 NH961/962 will be operated on a B777-300ER. NH963/964 will be operated on a B767-300ER. However, from December 1, 2018, it will be operated on a B787-8. The aircraft types used to service return flights will be changed on the following day. *14 NH967/968 will be operated on a B787-8. The aircraft types used to service return flights will be changed on the following day. NH971/972 will be operated on a B767-300ER. However, from March 1, 2019, it will be operated on a B787-8. The aircraft types used to service return flights will be changed on the following day. Domestic routes and cargo flights not covered here. Note: ANA has already sent a Boeing 787-9 to Brussels several times in the past, when traffic justified a larger aircraft. The fact that the 787-9 becomes permanent is a show of confidence in the route. What a pity that Brussels Airlines cannot codeshare on this route because of the Russian overflights rights were not granted to the Belgian airline, even as a codeshare.